WARNING: CHOKING HAZARD Keep out of reach of small children! Note that these ARE NOT TOYS, AND ARE NOT INTENDED FOR USE BY CHILDREN UNDER AGE OF 14. These products are Model Railroad Equipment and Accessories intended for use by adults. For Canadian Customers Only: Free shipping on orders valued at $25 (US Dollars) or more (I will send a Paypal refund). HST or GST is included in the price, no additional taxes will be added at checkout. This is a scale model kit of a 1934 BB series tow truck. The BB series was in production from 1932 to 1934. It was equipped with either the standard four cylinder or the optional “flathead” V-8 (this kit depicts the V-8). The BB-157 indicates the longer wheelbase version (157”) rather than the shorter wheelbase version (131.5”). This kit includes 8 3D printed parts; chassis, cab, tow bed, hoist, tool chest, lifting frame and 2 spare wheels. Also included, one sheet of decals and fine wire..
Download the PDF Instruction Sheet for the Tow Truck. The Dodge Power Wagon was mechanically derived from the WC series of 3/4 ton military trucks. Introduced in 1946 as the first postwar civilian production 4x4 truck; it featured an enclosed all-weather cab, an 8-foot cargo box, 126 inch wheelbase and a 230 cubic inch flathead inline-six engine. Download the PDF Instruction Sheet. and also 1 decal sheet. Introduced in April 1943 the canvas covered cab version of the CCKW military truck replaced the earlier metal closed cab type. Over 155,000 of these trucks were produced. Some like this one were equipped with a winch mounted behind the front bumper. 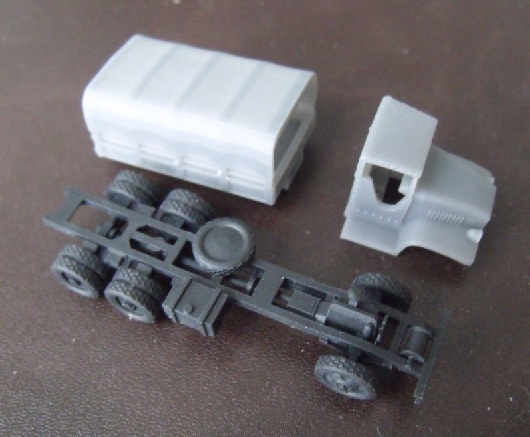 This is a 3 piece kit which includes a 3D printed chassis, a 3D printed cab and 3D printed cargo bed. Also included, 1 decal sheet. Production of the US6 truck started in 1941 and over 200,000 were built during World War 2. Over 150,000 were exported under the lend-lease program mostly to Russia. The US military used these trucks in the construction of the Burma Road and in North America on the Alcan (Alaska) highway. This kit can be built with dump bed lowered or raised. These are scale model kits of the 1934 BB series truck. The BB series was in production from 1932 to 1934. It was equipped with either the standard four cylinder or the optional “flathead” V-8 (this kit depicts the V-8). The BB-157 indicates the longer wheelbase version (157”) rather than the shorter wheelbase version (131.5”). The kit is available with two different cargo bed/loads, a stake bed with beer kegs or a flat bed with a lumber load. This is a 4 piece kit which includes a 3D printed chassis, a 3D printed cab, a 3D printed cargo bed and a 3D printed load. Also included, decals. Download the PDF Instruction Sheet for the Beer Truck. 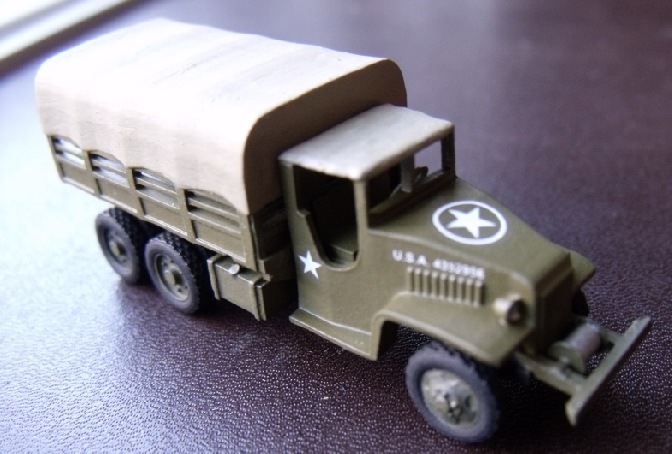 Production of the US6 truck started in 1941 and over 200,000 were built during World War 2. Over 150,000 were exported under the lend-lease program mostly to Russia. The US military used these trucks in the construction of the Burma Road and in North America on the Alcan (Alaska) highway. 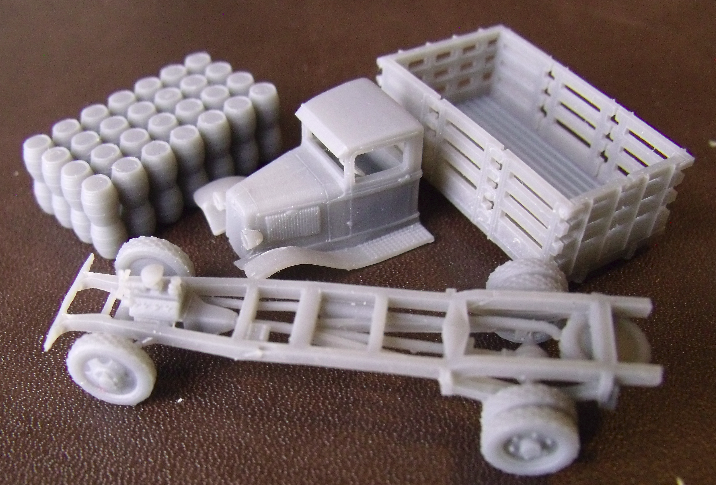 This is a 3 piece kit which includes a 3D printed chassis, a 3D printed cab and 3D printed cargo bed. Also included, decals for US Army and Red Army/Warsaw Pact vehicles. Same as above, except hood is open to reveal engine.